Villa Seven Swifts is an elevated and an elegantly built holiday paradise which situates you above the ocean for a mesmerizing view. The lush greenery that surrounds this villa will take you to a tropical sanctuary. 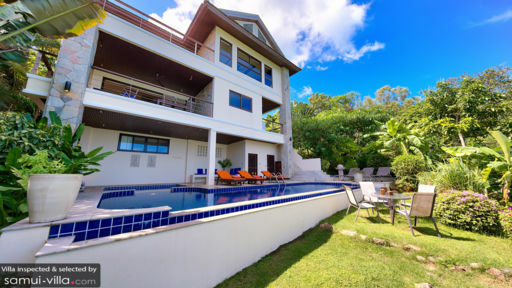 This three-floor villa will spoil you with the captivating ocean vista and the lush greenery almost anywhere you are. Its exquisite decor will make you feel cozy, as if you are staying in your very own townhouse for some respite time. Villa Seven Swifts is home to 5 fabulous suites. The master bedroom is equipped with a 32” smart TV and a luxurious bathroom offering his and hers basins, double shower and an exclusive bathtub. This room also offers a spacious balcony which allows a private suntanning experience on the loungers provided while enjoying your ocean view. There are 2 other bedrooms with en-suite shower rooms, one offering a stunning sea vista through the glass windows, and one with its own shaded balcony that overlooks the lush greenery. The other 2 bedrooms with shared en-suite shower rooms are located on the poolside which still offers a good view across the bay. The outdoor area of Villa Seven Swifts is tucked amidst a garden paradise which is sure to ease your eyes while you take a dip in your private swimming pool or your exclusive bubble spa. Sunloungers are also provided for an optimal bonding time by the pool with your family and friends while overlooking the Bangrak Bay. The staircase beside the pool leads up to the kitchen area which has a washing machine and a gas BBQ for your utility and enjoyment. The air-conditioned living room and the dining area are separated by an elegant divider that matches a bonus beanbag for a cozy atmosphere around the area. The living space of Villa Seven Swifts is furnished with a flat screen TV, stylish chic furnitures, a ceiling fan, and detailed decors to add on to the homey vibes that this place exudes. The clear windows around will never make you forget that you are currently nested in a tropical paradise. A luxurious kitchen not discounted of the calming view of the green hues around the villa is also available for your possible chef-moment. This area is exquisitely furnished with well-varnished cabinets, granite table tops and modern kitchen appliances. At the side of the spacious couch area is a full glass sliding panel which opens up to the finely appointed private balcony. The seaview terrace allows for an alfresco dining experience with a captivating coastal scenery of either the sunrise or the sunset, whichever you please! You will be warmly welcomed and attended to by a friendly Guest Manager whom you can consult to maximize your holiday stay at Koh Samui. Should you go hungry, you can request for a private chef to serve you with your desired cuisine at an additional cost. 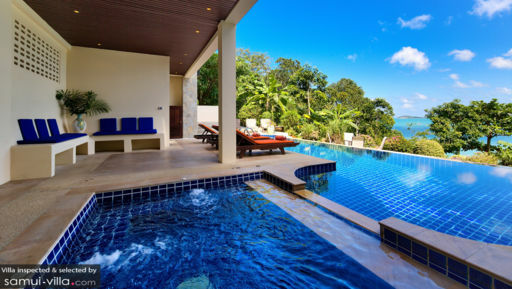 A complimentary back and forth airport transfer is also provided in Villa Seven Swifts so fret not if this elevated paradise seem inaccessible. Take a walk down your private pathway to the secluded beach below your villa and enjoy the variety of restaurants, spas, and tourist shops. Hire a private transport for a day and explore the major shopping and supermarkets which is just 20-minute drive from your villa. Even nearer is the famous Fisherman’s Village for an adventurous day out, just 5 minutes away.